Microsoft Office To-Go Device Manager utility that is integrated in Microsoft Office 2010 Starter Microsoft installer Beta, allowing users to bring Word and Excel Starter 2010 Beta Starter 2010 Beta on a USB drive for use. 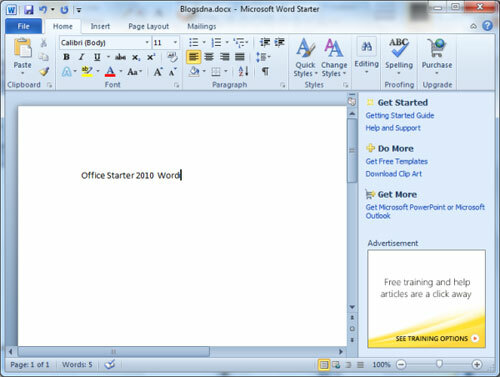 Includes only Word 2010 Starter and Excel Starter 2010 Beta Beta with basic functionality for word processing and spreadsheets, Microsoft Office Starter 2010 Beta is quite compact, suitable for ordinary user object. You also do not worry about copyright issues because Microsoft Office 2010 Beta Starter from Microsoft's free. While Word 2010 and Excel 2010 are 9 card command interface Word Starter 2010 and Excel Starter 2010 Beta Beta is only 5 command cards File, Home, Insert, Page Layout, Mailings . 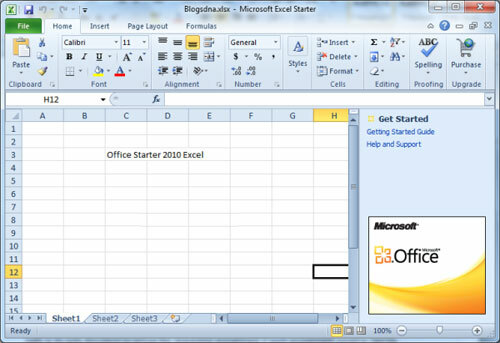 By testing, you can install Microsoft Office 2010 Starter Beta installed on your computer to use Microsoft Office 2003 Word Starter 2010 Beta parallel with Word 2003, Excel 2010 and Excel Starter 2003 Beta with. Download finished, run the file SetupOffice2010Starter.exe to start the installation process online through Microsoft Office Starter 2010 Beta four steps (requires computer Internet connection) . Installed, you attach a USB drive that will contain the Microsoft Office 2010 Starter Beta on your computer, then go to the Start menu> All Programs > Microsoft Office Starter (English) to see all applications of Microsoft Office 2010 Starter Beta, including Microsoft Office To-Go Device Manager 2010 (Beta). In the dialog box that appears after clicking this application, you click Start . The process of downloading the required components to help you manage Microsoft Office Starter 2010 Beta USB drive will take place later (it can take more than 10 minutes). Complete the dialog box and move to Manage Devices , click the drive you USB will install Microsoft Office 2010 Starter Beta (about 338MB) and then click Install . When the dialog box with the message Installation Completed appearance is completed. If you want to continue installing Microsoft Office Starter 2010 Beta on a USB drive, you click Create Another Device . To exploit Microsoft Office 2010 Beta Starter from a USB drive, open USB drive and then click double-click the file Office.exe (the remaining data will be located in hidden folders VirtualApplications ). In the dialog box, click the application you wish to launch below appears, click the icon Microsoft Word 2010 or Microsoft Excel Starter 2010 Starter to open the corresponding application. Link Quick Repair bottom right corner for quick fixes installer Microsoft Office 2010 Starter Beta on a USB drive. In the dialog box that opens, you click Yes to confirm. Note : If you need to uninstall Microsoft Office Starter 2010 Beta from the USB drive, first you activate Microsoft Office To-Go Device Manager 2010 (Beta) from the Start menu > All Programs > Microsoft Office Starter (English) , click Drive select USB install Microsoft Office 2010 Beta Starter dialog from the Manage Devices opens, and click Uninstall bottom. Note : Microsoft Office Starter 2010 Beta only be installed on Windows 7 or Windows Vista SP1.